Mambazha Pulissery is a ripe mango curry.A sweet n sour curry made with mambazham/ripe mangoes and yogurt.Ripe mangoes enhances the taste,even pulissery can be madewith,pappaya,cucumber,pineapple. We usually eat it with Rice. 1.Take Mango pieces in a pan. Add turmeric powder, , salt, 1/2 cup of water and bring it to a boil. 2.Grind the coconut, green chilly and cumin seeds into a paste. 3.When the water is reduced to 1/3 and the mango pieces are cooked, add the coconut paste. 4. Bring it to a boil. Beat the yogurt till smooth and add to the mango mixture. 5.Cook till it boils by stirring continuously. Remove from flame. 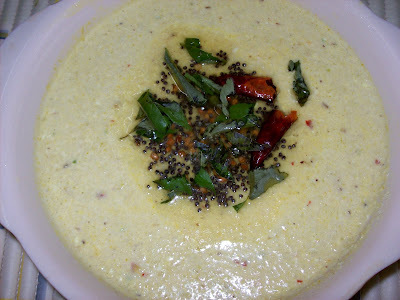 6.In a small pan heat the oil and add the mustard seeds, fenugreek seeds, red chilli and curry leaves. Pour the seasoning over the yogurt mixture and serve.